Pistachios or cashews, ghee, flour, sugar, corn starch. Bukaj is the only pastry among all assorted Baklava pastries that has the filling totally exposed. Instead of sandwiching the filling like in original Baklava or of enclosing the filling like in Fingers, Bukaj on the other hand resembles an open top purse filled with nuts such as pistachios, or cashews. Pronounced [bu-kahj], it comes from the Lebanese word “bukjah” which refers to an old fashion way of making a suitcase from a large piece of fabric. Personal items would be placed in the middle of a large square piece of fabric which is then pulled from its four corners to enclose the items. Bukaj, the pastry, is made in exactly the same way substitution the fabric for the phyllo dough and the personal items for nuts. The thin phyllo dough and the sugar syrup are first prepared. Then open top purse shaped pastry consisting of raw nuts inside a bowl of phyllo dough are prepared and baked. Bukaj is made of the same phyllo dough used in making original Baklava. Flour, water, and a hint of salt are mixed together to form the phyllo dough which is then cut into small balls, each kneaded extensively to form a very thin layer of phyllo dough. To form the purse shaped Bukaj, about nine layers of phyllo dough are stacked while adding starch between each two layers. The phyllo dough is then cut into small square pieces. 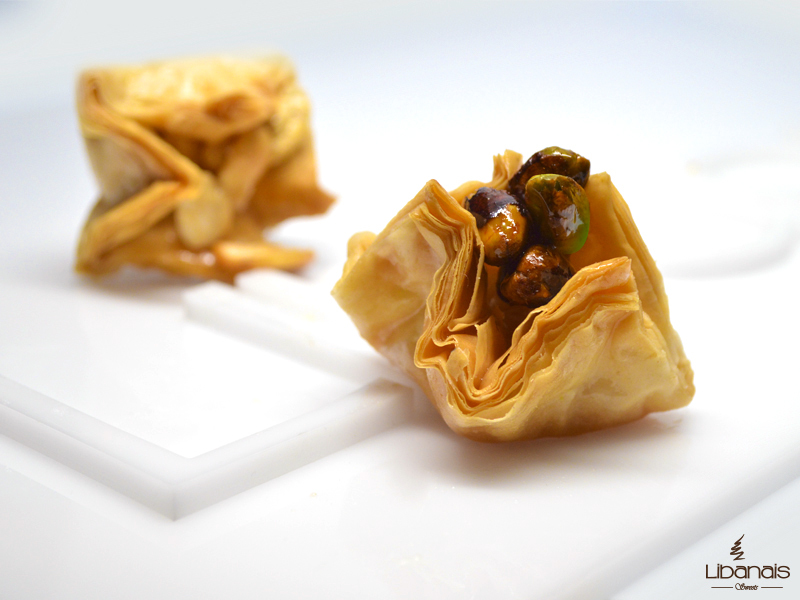 Next, filling which consists of either pistachios or cashews is placed in the middle of each square of phyllo dough. Finally, each square of phyllo dough is pulled from its four corners and pushed against the filling in the shape of an open top purse, or the old fashioned Lebanese “bukjah”. The Bukaj pieces are placed on a baking sheet, and hot melted ghee is poured on top. After baking for about one hour on medium temperature, the remaining ghee is drained and sugar syrup is added on top. Bukaj is served as a dessert usually as part of assorted Baklava and Lebanese sweets arrangements. Bukaj is most popular in Lebanon, but it has gained worldwide popularity as well. Bukaj is one of the Assorted Baklava pastries that is made with phyllo dough. Assorted baklava pastries are made of two forms of dough: Paper thin sheets of phyllo dough and thin strings of dough called knafeh dough. Bukaj is one type of the Lebanese sweets family.